Madrasi is your city guide to Chennai India. From automobiles to education, from latest cars to travel, you will find it here. Look up the Chennai city portal with a difference! If you are looking for educational opportunities in Chennai or even abroad, Madrasi is your reliable guide. From engineering and medical colleges in Tamil Nadu to admission procedures to various foreign universities, we keep you updated and informed! Ph:91-79-26307241 IIM-A was conceived not to be purely a business school, but a school of management. It aims to professionalise some of the vital sectors of India's economy such as agriculture, education, health, transportation, population control, energy, and public administration. In its formative years, IIM Ahmedabad collaborated with the Harvard Business School. Largely as a consequence of this collaboration, IIM-A pioneered the case method of teaching in India. 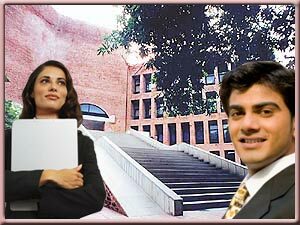 IIM Ahmedabad is considered to be the toughest business school in the world to get into. Ph:91-80-26582450 IIMB runs a student exchange programme in the country; partner schools include NYU Stern, GSB Chicago, Anderson (UCLA), WHU Germany, the London School of Business and the LAOTSE network of leading European and Asian universities. In order to provide more students with an international exposure, IIMB has a course on international business that involves project work with a participating company at a foreign location. The international linkages at IIMB are so strong that about 70% of the batch has some international exposure during the course. Diamond Harbour Road, Joka, Kolkata (Calcutta) - 700104. Ph:91-33-24678310 Intaglio is the annual international business school festival of IIM Calcutta. It is one of the premier business school fests in the Asia Pacific region inviting participation from the top business schools across the world including Harvard Business School, The Wharton School, the Tuck School of Business, Yale School of Management, the Kellogg School, NUS and many more. Ph:91-522-2734101 IIML 's mission is to be a global, socially conscious and integrated school of management, contributing towards management development, both in India and abroad. IIML is also entering into collaborative arrangements with leading business schools and research centres in India, Europe, Canada, South and Southeast Asia. Ph:91-731-4228400 Indian Institute of Management Indore was set up in 1998 and is the youngest of the IIMs. The institute had its first student exchange of six students with Ecole de Management de Lyon (EM Lyon) a premier business school based in Lyon, France in 2005. The exchange program has advanced rapidly and the institute currently (as of 2006) has exchange programs with two business schools in France, one in China and one in New Zealand with several others on the anvil. IIMK Campus P. O., Kozhikode, Kerala - 673570. Ph:91-124-2349831 to 36 The institute operates student exchange programmes with a number of premier business schools and universities around the world; partner schools include Queensland University of Technology, Middlesex University(London), Cambridge College(USA) etc. Ph:91-11-27667002 FMS has exchange programmes and collaborative arrangements with leading industrial and business houses, management institutions and professional associations in India and abroad. Circuit House Area (East), Jamshedpur-831001. Ph:91-657-2225506 to 12 One of the Premier Jesuit institutions in India and named after the Roman Catholic Saint - St.Xavier, XLRI is arguably the first in the top 5 Business Schools in India. Its 1 year General Management Program is probably the best 1 year MBA program. Accenture and XLRI have launched the Accenture-XLRI HR Academy, a training academy dedicated to the human capital management needs of the growing information technology and BPO industries. Ph:91-22-26237454 Bharatiya Vidya Bhavan's S P Jain institute of management and research has emerged as one of the pioneering business schools in the business schools in the country. It has consistently maintained a hundred percent recruitment record, and takes pride in the fact that its students have consistently exceeded expectations of recruiters. The partners of this institution include Infosys, Wipro, Accenture, Microsoft etc. Ph:91-11-26965124 IIFT has, over the years, undertaken research studies with organisations like WTO, World Bank, UNCTAD and the Ministry of Commerce & Industry, government of India. IIFT has also trained more than 40,000 business professionals across 30 countries in various facets of international business and trade policy via its management development programmes. Ph:91-022-26134577 Management Development Programmes (MDP) are held across the year at the Institute. MDPs are an integral part of the institute's activities and critical to its interaction with industry. The Institute puts together conceptual thoughts and corporate experiences for the benefit of the organizations. Ph:91-674-2300007 Another premium Jesuit institution in the model of its illustrious predecessor XLRI, XIMB provides training and consulting services to the corporates. Their strong domain knowledge in the fields of education and development and software delevlopment skills have led to develop software products. Academic Information System (AIS), Project Accounting and Monitoring System (PAMIS), Internet based Survey (iSurvey), Examination On-Line (EOL) are some of the products they offer. Ph:91-120-2825083 The institute works with certain companies on research projects. The list includes organizations like Polaris, CSC, R Systems, TCS, ST Microelectronics etc. The institute has a campus in Nagpur and will offer both its flagship business management and computer applications programs from there too. Ph:91-40-23435301 to 05 The education methodology adopted by IBS encourages independent thinking and helps students to develop a holistic perspective, strong domain knowledge, contemporary skill-sets and a positive attitude. IBS also gives the utmost importance to the case study method of teaching, through which students develop analytical and problem solving skills relevant to the dynamic world of business. B 10 Qutab Insitutional Area, Tara Crescent, New Delhi-110016. Ph:91-11-26961437 IMI holds a place of distinction among the premier schools of management for being the first corporate sponsored business school with strong international orientation in India. IMI follows international standard curricula in its programs, which has been enriched by its academic collaborations with International Institute for Management Development (IIMD), Lausane (erstwhile International Management Institute, Geneva); Faculty of Management, McGill University, Montreal, and Manchester Business School, U.K, prepares participants to successfully manage and lead in an increasingly global business environment. ii) International Business strategies and regional studies. iii) Accounting and Business Finance-Social responsibility and human resource accounting, investment decision making and innovative financing. L. Napoo Road, Near Matunga (Central Rly. ), Mumbai- 400 019. Ph:91-22-24178300 Welingkar Institute of Management Development & Research is a business school in Mumbai, India. It is one of the top notch B-Schools in India & is gradually gaining world recognition. The greatest recognition came from the Singapore-based Asia Inc, which ranked Welingkar 8th amongst all South Asian business schools. Ph:91-820-2571358 The curriculum's thematic flow reflects current realities in business, and aims to develop both personal and professional competency. TAPMI's autonomous status enables this flexibility. Its PGDM programme is recognized for its innovative curriculum and academic rigour. Amity Campus, Sector 44, Noida- 201303. Ph:1800-11-00-00 (Toll Free) Amity is the leading group of private educational institutions in India with over 40,000 students, 72 institutions spread over 22 campuses. Amity is always at the forefront of technology and education and was one of the first to launch programs like Cyber Law, Bio-informatics and Nanotechnology among many others. 19th Cross, 7th Main, BTM II Stage, N.S. Palya Bangalore - 560076. Ph:91-080-26681444 The Institute offers courses in addition to the regular courses prescribed for the programs for which additional certificates will be issued. These certificates are of high potential value to our students for placement purposes. Ph:91-44-28273801 Recognized as a Social Science Research Institute by the Department of Scientific and Industrial Research, Government of India, IFMR is approved as an institution of national importance by the Ministry of Finance. Ph:91-02717-241900 to 904 A constituent of Nirma University, the Institute of Management is recognized by the University Grants Commission (UGC) under Section 2 (F) of UGC Act. Hence, all the Post-graduate degree of the Institute is recognized as equivalent to the Post-graduate degree of any other Indian university. Ph:91-11-26191081 Lal Bahadur Shastri Institute of Management is a premier Institute providing quality education in Management and Information Technology. The Institute has been consistently ranked among top 20 institutes in the country and among top 13 in the country based on placements. Ph:91-022-25157219 The Institute in collaboration with the Ivy League institutions has designed instruction in Fund Management wherein, students actually practice fund management by trading online on a NSE terminal.The institute is finalising plans to launch special programs in Entrepreneurship Management, Family managed Businesses, Management of Small and Medium Enterprises (SMEs). Alliance also includes student and faculty exchanges with Johnson School of Management , Cornell University , USA. Ph:91-0431-2520502 BIM has been providing world class management education through its two-year full-time MBA programme. Over the last two decades, BIM has risen to prominence as one of the premier management institutes in India. Currently, BIM has an annual intake of 120 students. BIM has recently formed an academic collaborative partnership with Bangalore Management Academy (BMA). Ph:91-0120-2323001 to 10 BIMTECH has explored opportunities for the students and faculty to exchange discussion and meet them for the best of the academic practices around the world and also to face the global changes. Some of the partner universities and institutions for various activities under a formal or informal arrangement are Groupe ESC Rouen(France), School of Public Policy and George Mason University(USA), Philadelphia University(USA), Precise Learning and Development(UK) and many more. Ph:91-020-66741249 IIMM is a unique and autonomous Management Institute known for its distinct course curriculum and innovative training methods. The quality standard of IIMM can be seen from the fact that more than 200 companies have recruited the students and hundreds of prestigious companies have provided project studies to the students of IIMM. Ph:91-22-27708376 / 77 The SIES College of Management Studies (SIESCOMS) was promoted by SIES in 1995 specifically to cater to the growing need of management education in India . It is the prime constituent of its academic complex at Nerul. The major recruiters of SIESCOM include Compaq, Siemens, MTV etc. Ph:91-44-28175353 to 57 LIBA is one of the premier management schools in India, recognized for providing business education par excellence. LIBA now offers into Virtual Learning or Global Satellite Education. A satellite education programme has been launched in association with Hughes Escorts Telecommunications Ltd. (HECL). The major recruiters of LIBA include TCS, Hexaware Technologies, Philips India, Satyam Computer Services etc. Ph:91-33-22418694 The Institute now has about 1200 students of which over a third are women. The Institute has a very effective placement programme, which helps students start satisfying and rewarding careers. Ph:91-80-28528477 The Xavier Institute of Management & Entrepreneurship (XIME), Bangalore was established in June 1991 to contribute to excellence in Management and Entrepreneurship education in India. The institution offers a three year, part-time Post Graduate Diploma in Business Management (PGDBM - AICTE approved) in collaboration with HAL, BEL, BEML, KIOL and other leading industrial organizations in Bangalore. Ph:91-22-27905002 ITM has sought partnerships with premier Universities and schools from around the world including Southern New Hampshire University(USA), Queen Margaret University College(Scotland), Groupe ESSCA(France), Tongji University(China). Ph:91-11-29891529 NIILM Center for Management Studies is now counted among India's top ranking business schools. NIILM CMS has an excellent placement record in terms of compensation and positions offered to its graduates. PB No. 1668, Peelamedu, Coimbatore - 4. Ph:91-0422-2577252 The PSG Institute of Management was upgraded from Dept of Management Sciences, PSG College of Technology in the year 1994,a time when the liberalization was throwing open endless possibilities in the business front for India. PSGIM has a strategic partnership with IIFT(Indian Institute of Foreign Trade), The Alliance Francaise of Madras. Amrita Vishwa Vidyapeetham, Ettimadai, Coimbatore-641105. Ph:91-422-2656422 Amrita School of Business (ASB), earlier known as Amrita Institute of Management, started in 1996 by the Mata Amritanandamayi Math. Over the years, Amrita School of Business has undertaken a wide spectrum of industry interface activities like Management Colloquia, MDPs, Consultancy and Customized In-Company Programmes. Ph:91-11-26875875 the institute has given its students the opening to develop and apply functional, management and cross-cultural skills and concepts in global business contexts. This is done through collaborative and exchange programs with various institutions abroad such as University of California(USA), INSEAD(France), Esade(Spain) etc. Ph:91-120-2403379 to 81 JIM is endeavoring to become one of the Top Business Schools of International repute and thereby attaining status of a BENCHMARK in the field of Management. Lal Quan, Bulandshahar Road Ghaziabad-201009. Ph:91-120-2866033 IMS Group of Institutions based at Ghaziabad, was founded in 1990. The two-year full time Post-Graduate Diploma in Business Management Programme has been accredited the MBA - Equivalent Status by the 'Association of Indian Universities'. Ph:91-080-22127765 St Joseph's College of Business Administration (SJCBA) was established in the year 1996. The past recruiters include Accenture, Hewlett Packard, HCL, IBM, Infosys etc. Ph:91-674-2302633 RCM is one of the premier educational institutes in the state and is rated amongst the top B Schools of the country.The institution was established in the year 1982. The past recuriters include Godrej, TISCO, Wipro etc. PG Centre, 58, Palace Road, Bangalore - 560052. Ph:91- 080-22286744 Mount Carmel College for Women, established in 1948, is ranked amongst the foremost educational institutions in the country imparting value-based education. The past recruiters include Infosys, Wipro, Accenture, L&T, TCS etc. Ph:91-22-28454949 Established in 1995, N. L. Dalmia commenced its academic programs in July 1997, offering Master's in Management Studies (MMS). The placement partners of the institution include Bharat Petroleum Corporation Ltd., Godrej & Boyce Mfg. Co. Ltd., Hexaware Technologies, L & T etc. Ph:91-484-2623803 SCMS is a business school established in Cochin in the year 1976. The Post Graduate Diploma in Management (PGDM) offered by SCMS is a highly acclaimed professional programme in India. Ph:91-0120-2788082 IPM - the institution was established in the year 1977. The Institute offers various Management Programmes such as Post Graduate Diploma in Business Management, Post Graduate Diploma in Business Management -Executive Programme. The specialized programmes include Marketing, Finance, Information Technology, Human Resource Management, Production, International Business. Ph:91-891-2790505 The institution has collaboration with Institute of International Management, Karl Franzens University, Graz, Austria, for student and faculty exchange programme. Ph:91-821-2429722 The core offering of the Institute is the two year mandatorily residential PGDBA programme approved by he AICTE, with an intake of 120 students per batch. The past recruiters include Accenture, Infosys, Intel etc. Ph:91-020-25431795 MITSOM, Pune, has been striving to cater to the needs of modern management education by using conventional as well as modern autonomous means. MITSOM boasts of having placed its students at reputed Indian Corporate Houses and MNCs. Some of the recuriters of the MIT include Wipro Spectramind, Pepsi, HSBC, Reliance Infocomm etc.